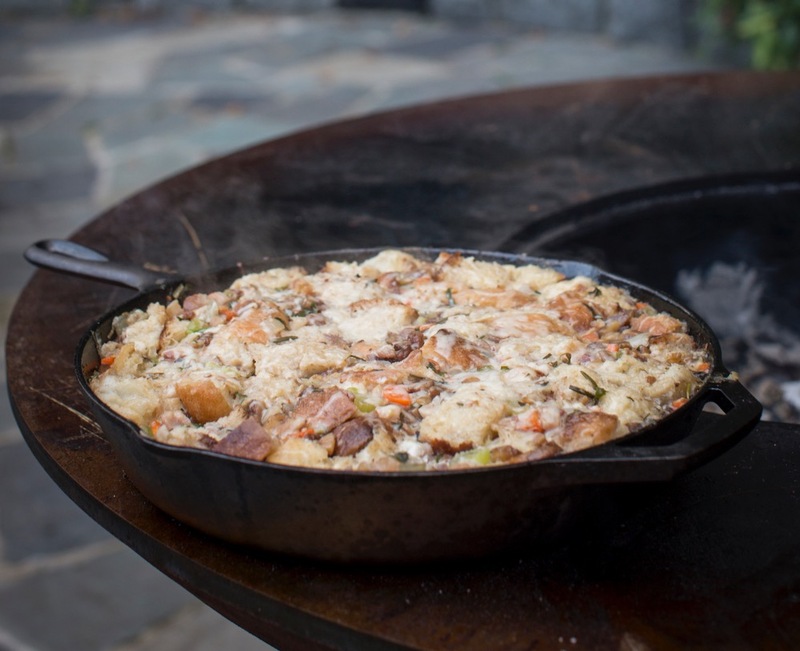 Come gather around the flame to cook Mama O'Neill's famous Italian-style stuffing. Made with ciabatta bread, chestnuts and pancetta, this aromatic stuffing is rich, delicious and sure to please. In a large cast iron skillet (that has a cover/lid) melt the butter. Cook the cubed pancetta in the butter until browned (not crispy).Remove pancetta with a slotted spoon to leave the fat.Put garlic and onion in skillet and cook until translucent. Add carrots, celery, chestnuts, salt & pepper, then herbs.Stir every few minutes until veggies soften. Put the pancetta back in. Add in chopped ciabatta bread, then evenly pour in the chicken stock with the beaten egg.Sprinkle in parmesan and toss to coat. Cover and let cook for 5 minutes.Toss again, cover and let cook 15 – 20 minutes. Remove and let sit 5 minutes before serving. * Make sure the skillet is on a medium hot section of the grill. Move it around to make sure the bottom doesn’t burn and the stuffing cooks evenly. For more Thanksgiving recipes watch our video HERE.